Vecsey was one of the wunderkind who so enraptured the musical world in the first decade of the twentieth century. A Hubay pupil and almost exact contemporary of fellow pupil Szigeti, Vecsey’s meteoric career ended with his premature death in 1934, although in truth he had limited concert-giving after his marriage a decade earlier. I’m not aware that there’s a biography of him though he would make a good study for one. There were prodigy tours to cities galore – I’m sure all collectors have come across the Vecsey and Elman regulation sailor suit postcards of c.1907 – and recordings as well. In Vecsey’s case he recorded for Fonotipia and allied concerns. He was lauded by Joachim, lionised by society, toured with Bartók, travelled to South America, and published his own works. Which brings us to this collection of his salon, morceaux and other compositions, ones that span the years from 1912 to 1921. The two transcriptions were published the year before his death from an embolism following a minor operation. Shades of the botched Feuermann operation. These are violinistically assured works strong on salon charm. 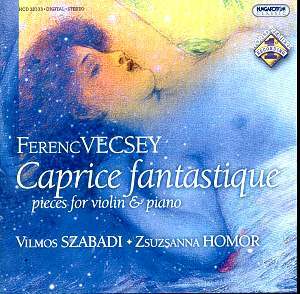 There are hints that Vecsey has listened to some contemporaries – possibly Saint-Saëns in the Chanson triste – and Kreisler in the Minuette, the third of the 1912 Morceaux. For the executant he also adds a few in-jokes – listen out for the brief allusion to Tartini’s Devil’s Trill in the Chanson triste for instance. Rêve, the first of the Morceaux is almost a paradigm of the salon style and was written when its composer was nineteen. A Toi is a beautiful piece, full of sentiment, and a second cousin of Elgar’s Salut d’amour. Valse lent hints at rather more advanced harmonies but Devant un Tombeau (1921) is altogether different – an almost luridly macabre piece, the musical analogue of Edgar Allan Poe or the spine chilling tales of M.R. James. The greatest seriousness of compositional purpose however is reserved for the Prelude and Fugues I and II, works that are almost Bachian paraphrases. They don’t obviously have the transmutational genius of Ysaÿe’s solo works but they do offer an avenue into the preoccupations of a violinist who was often viewed as merely a technician parading his Paganinian wares. Vilmos Szabady and Zsuzsana Homor make a fine case for this collection. That said, for all that Szabady is a fine player with a string of highly regarded discs to his name, there were times when I felt he could have sculpted the music with greater incision. That difficult finger-tester, the Caprice for Violin No. 2 "Cascade," tends to hang fire. Vecsey recorded this for Polydor electrically and plays it with really incisive bowing and rhythmic lift. Similarly Arthur Grumiaux’s recording of Valse triste is more detailed, textured and emphatic than Szabady who, not for the only time, rather hangs fire and lets the piece play itself. Still, this unique disc joins the ranks of those devoted to other violin-composers who swam in the post-Kreisler age – the Sammons-Hyperion prominently – and expands our appreciation of a player now long forgotten.